You are not powerless. If you easily give up without even a word of opposition, you have surrendered your strength. We need your financial support to help us continue to raise awareness in local communities about the dangers of 5G millimeter wave technology. Your contribution will enable us to organize community awareness meetings, develop educational materials, and pay for experts as needed. We hire consultants who are Building Safety Specialists/Certified Safety Professionals, engineers, telecommunications experts, attorneys, and other professionals to ensure the information we provide is the most current and accurate available. Our small team also attends local state of the union town halls with our state and local representatives, speaks at neighboring city council and planning commission meetings, and coordinates activities (including an upcoming rally!) across the East Bay. The 680 Corridor is where Verizon is targeting their latest high-density deployment of Close-Proximity Microwave Radiation Antennas (CPMRAs), which the wireless industry has gently labeled "small cells". They have 87 CPMRAs planned for Orinda (13 square miles), approximately 120 for Danville, and similar numbers for Lafayette, Moraga, Walnut Creek, Alamo/Tice Valley, Pleasanton, Dublin, and San Ramon. We continue to build on our victories locally, but our fight isn't over. The most pressing issue for Danville right now, is to develop a strong, citizen-oriented, protective wireless ordinance and stop any licensing agreements with Verizon so this doesn't happen again. As part of our efforts to raise awareness, we meet with other citizen leaders to discuss the strategies that Verizon, AT&T and Sprint (and their subcontractors Crown Castle and Epic Wireless) are using so we can be ahead of the curve when they come at us with threats and bullying tactics that make local elected leaders and city staff fearful of being sued. Our team has been gathering successful local wireless ordinances and is working to ensure that similar language is incorporated into our local ordinance. We are also working with Governor Newsom, Congressman DeSaulnier, Assemblymember Bauer-Kahan, Representative Anna Eshoo, as well as organizations and experts that include Dr. Joel Moskowitz, Ellie Marks (founder of the CA Brain Tumor Assn), Eric Windheim, and many, many others whose names you've likely heard. We are working to change things, raise awareness, and lobby to change the law which favors wireless providers over people. While we have been successful with our appeal and in raising awareness about this issue more than ever before, the fight is far from over. Even in Danville, our own town staff and Town Council have been working on a licensing agreement with Verizon the entire time that we were fighting to save the one site. Many leaders and city planners are doing the same thing to their residents - claiming that their hands are tied and they are the victims of the FCC, while revising their once-protective wireless ordinances to take advantage of Verizon et al revenue streams. We are at odds. Unfortunately, the negative outcome of this situation falls entirely on the people who live in these cities. Help us stop this bullet train from mowing down every city in its path. Without adequate funding, we can't reach all of the people whose support we need to protect us all. Are Small Cells Next to Homes Safe? The short answer is no. Watch the video to learn more. Subscribe to our Facebook page for more frequent updates. Once again, we had near-record attendance at the March 5th Town Council meeting!!! More than 100 people showed up to voice their concerns about this dangerous technology. In February, our Town Council demanded that Verizon share their plans for the Town of Danville. Verizon refused. The Town asked that they at least share the plans for the existing application corridor (any planned towers for towers in the near vicinity of the current application under dispute). Thankfully, they did, as it allowed us to see how closely they wanted to place these Close-Proximity Microwave Radiation Antennas ("small cells") to people's homes and nearby schools. Their map was horrifying - it showed CPMRAs placed within 25 feet of homes all along Camino Tassajara (see below). No concern for the 24/7/365 microwave radiation that would be pouring onto these people's properties. Most families in Danville have children and/or grandchildren. This would render their yards unusable for the kids due to the intense exposure. More than 150 people attended the nearly five-hour Feb 5 meeting, in opposition to the Town Council's decision to approve a Verizon cell tower to be built 25 feet from a Danville neighbor's home. It was the best show of strength our community has ever seen at a council meeting, and IT WORKED! WE WERE HEARD. The Town Council did not take the town staff's recommendation to deny our appeal, but instead asked Verizon to extend the review period 30 more days during which they would evaluate the alternative locations we provided (on commercial sites, nowhere near any homes or schools). Verizon wasn't happy, but they reluctantly agreed. So we have 30 days to continue building up our strength within the community and to sit at the table with our town leaders and with Verizon to find a site that we can all "live" with. However, the fight is far from over. We need our attorney to stand up on behalf of Danville citizens. We need a revised wireless ordinance that protects residents. We need even more people to attend the ongoing Town Council meetings. 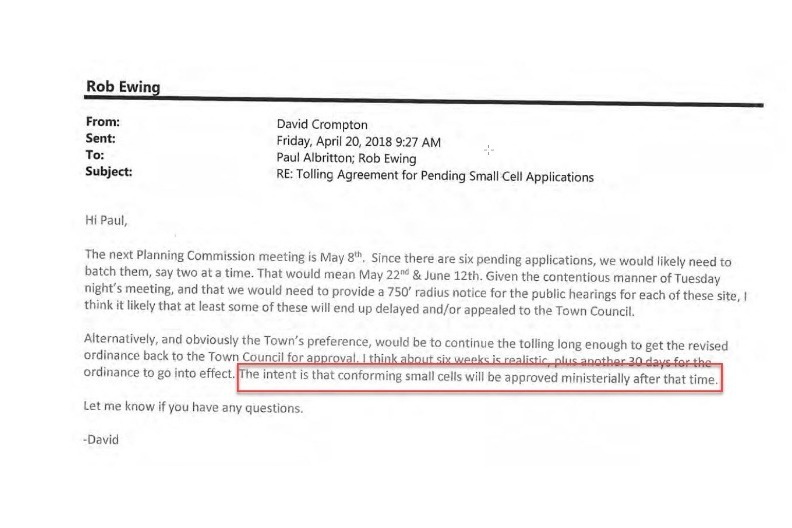 The Council's hopes are that people will lose interest, not show up, not email them, and let this massive cell tower deployment happen quietly. This is the time to stay committed to the cause and set the right precedent for how Danville allows wireless technologies to be deployed. Small cells are words coined by the wireless industry to sound benign/non-threatening. Small cells are actually Close-Proximity Microwave Radiation Antennas (CPMRAs). These are antennas that are deployed closer to homes than macro cells. However, deployed CPMRAs even within 1,500 feet of someone's home or a school is known to be detrimental. Most CPMRAs have a range of 4,000-6,000 feet (4G) and 2,000-3,000 feet (5G). Danville wants to place CPMRAs within 25 feet of people's bedrooms! Biological effects can result from human exposure to RF energy. Biological effects that result from heating of tissue by RF energy are often referred to as "thermal" effects. It has been known for many years that exposure to very high levels of RF radiation can be harmful due to the ability of RF energy to heat biological tissue rapidly. This is the principle by which microwave ovens cook food. Exposure to very high RF intensities can result in heating of biological tissue and an increase in body temperature. Tissue damage in humans could occur during exposure to high RF levels because of the body's inability to cope with or dissipate the excessive heat could be generated. Two areas of the body, the eyes and the testes, are particularly vulnerable to RF heating because of the relative lack of available blood flow to dissipate the excessive heat load. 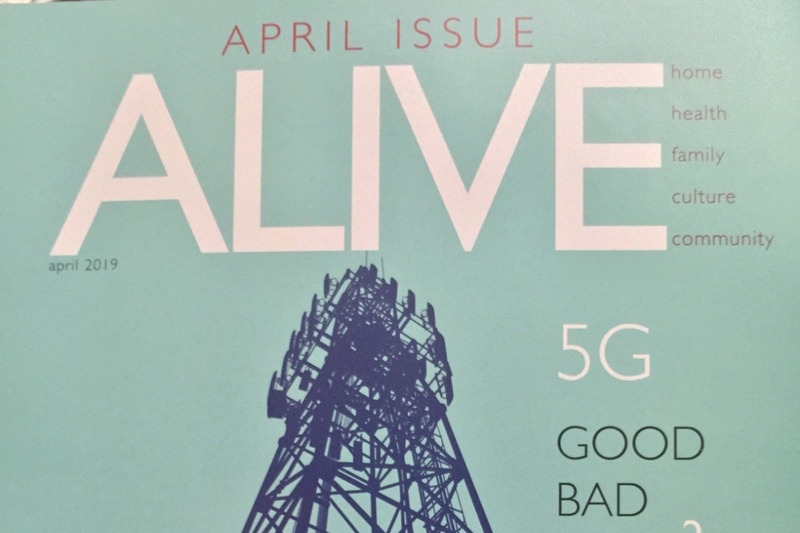 WHAT'S THE PROBLEM WITH 5G? Most of us want faster, more reliable wireless for streaming our movies and video games. However, in its current state, 5G (fifth generation wireless) is not safe to be deployed near people. It's a fact. The challenge is that the FCC is trying to legislate that Verizon and any other carrier cannot be denied adding more and more towers to your neighborhood. The head of the FCC, Ajit Pai, worked for Verizon. Most of his career has been in the telecommunications industry. His goal is to make the widespread deployment of 5G a priority for the United States, so that we can win the 'global race to 5G'. The FCC has allowed Verizon, AT&T, T-Mobile and all the other wireless carriers to do everything possible to expand their businesses, claiming they are within safety standards. These standards were developed in 1996. Things have changed since then, however the standards haven't been updated. If the law doesn't permit us to defend ourselves for health reasons, what can we do? We CAN stop these deployments by tightening local ordinances that keep 5G millimeter waves away from our homes and our families. Monterey did this successfully. Mill Valley , Petaluma , and others pushed back on Verizon successfully. This can be stopped in our neighborhoods. Why aren't Danville, Alamo, and Walnut Creek stopping residential deployments of 5G? The Danville Town Council and Contra Costa Board of Supervisors need to support us and stop these first sites before they start construction. Once the first site is approved, it's a tidal wave of deployments. We are asking them to create lawful, local ordinances that prohibit residential deployments. Based on the success of other cities, we know how to stop Verizon and help us keep our rights to property and health. Our challenge is trying to get our elected leaders to support us and work with us. There is no need to rush for an onslaught of 5G antennas blanketing Danville, Alamo and Walnut Creek California. We don't even have phones that can use 5G. We believe that our local government should slow down its plans to cover Danville with an untested, potentially unsafe technology. The law is being challenged at the state and federal levels based on its constitutionality, and the fact that it must address health impacts and safety. FCC Chairman Pai is being accused of collusion. Let's wait until we see the outcome before we go ahead and legally commit our cities into long-term Master Licensing Agreements with Verizon and AT&T that let them claim our cities, our property values, and our quality of life. Hundreds of evidence-based independent studies have concluded that the type of radiation emitted from cell towers causes cancer and other illnesses. Close-proximity microwave radiation is real. Its effects are real. We know that 4G radiation is unhealthy for us, which is why we are not supposed to hold our cell phones close to our heads. 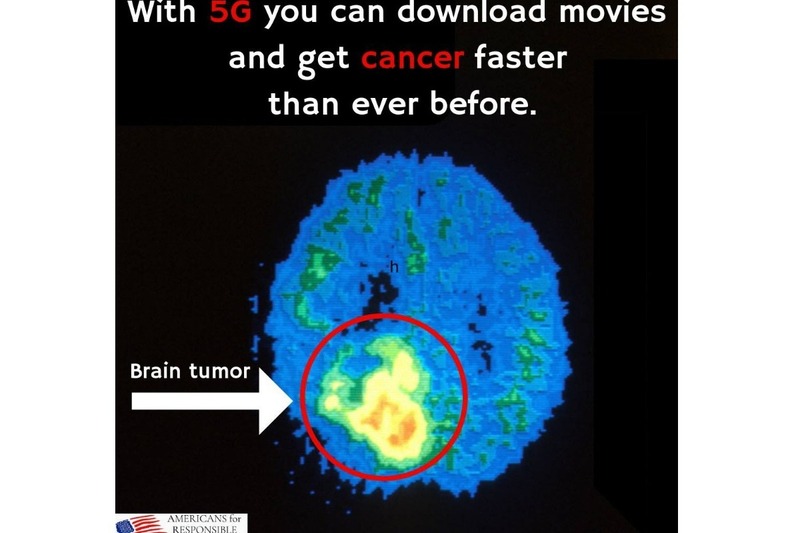 Now imagine the intensity of 5G microwave radiation as compared to 4G. These emissions are not even in the same band of the spectrum. 5G is at least 20 times more intense and it will absolutely affect your human cellular structure, causing neurological damage first and other, possibly fatal, effects over long-term exposure. Your immune system and brain function WILL be impacted. Do an internet search on "Active Denial", which is a military weapon system that successfully uses 5G millimeter waves to keep enemy combatants away. These studies prove that there are clear biological effects below FCC thermal safety guidelines, thus enabling us to use 5G as a defense tactic in warfare. Verizon's chairman and former CEO, Lowell McAdam, said their tests show that 5G signals travel 2,000 feet. One of his field engineers said it is in fact 3,000 feet - that's more than half a mile. He stated on CNBC, "I have never seen a technology that will be more disruptive". While he may have meant that it's a good thing, we know that it will be disruptive in an extremely negative way. So while Verizon and others are trying to grab up every utility pole on every right-of-way, it's overkill. They don't need these towers every 500 feet. But they are claiming as many sites as possible before the law changes, and we're confident that it will change. However, it may be too late for Danville and Alamo, who are the first areas to work alongside Verizon to initiate the tower clusters. WHY IS VERIZON PUSHING SO HARD IN DANVILLE AND ALAMO? Our town staff are really easy to work with, so why wouldn't Verizon continue to bulldoze Danville? David Crompton (Danville town planner) and Rob Ewing (town attorney) even sent Verizon and AT&T our DRAFT ordinance for their input! In addition, town staff and our elected leaders are doing Verizon’s work for them by promoting massive small cell deployments in our neighborhoods - on the town's own website! David Crompton is bending over backwards to help Verizon by trying to approve all cell tower applications ministerially (by himself, without public hearing). David lives in Benicia - so why should he care what happens to us in Danville? See his email below to the Verizon attorney Paul Albritton. The Town of Danville has even created a website and a multi-page color brochure to promote more wireless towers. Crompton indicates that citizens are literally begging for it. NOT TRUE. There is more opposition to this than ANY OTHER initiative since the ordinance was changed. There’s no mention of fiber as a safer, faster and better alternative. There’s no mention of the fact that the Town Council intentionally excluded the downtown business district from these deployments, opting instead for residential saturation. Even the Danville area Chamber of Commerce couldn't answer when residents asked why these CPMRAs aren't being deployed downtown instead of near homes and schools. They couldn't answer because the town leaders excluded the downtown! WHAT SITES ARE PART OF VERIZON’S BIG PLANS TO BLANKET THE EAST BAY? Danville is a Town. The majority of the people who live here chose NOT to live in a city. There is no reason for the Town Council to turn Danville into a highly densified microwave radiation city that no one needs. What Verizon has stated are THEIR needs, not OURs. Paul Albritton, Verizon's attorney, stated at the Feb. 5 meeting that their new Close-Proximity Microwave Radiation Antennas (CPMRAs) will not help with dropped calls or dead spots. They want to densify their network and takeover Comcast business. Why should WE suffer because THEY want to grow their business? 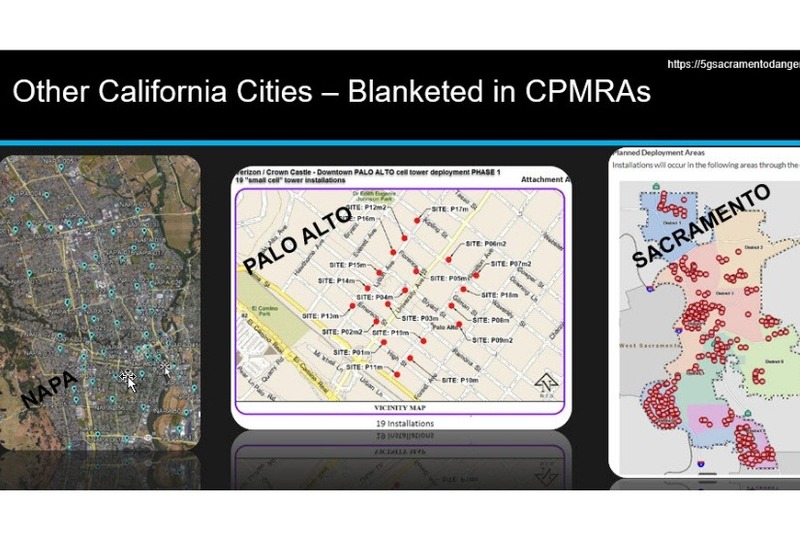 In Orinda, a Verizon engineer let it slip that they will want 87 sites with CPMRAs. Orinda is 13 square miles. In Alamo/Tice Valley, Verizon wants 22 initial sites (Phase 1), others will follow. In Danville, Verizon started with 7 sites in 2017, then they pulled them because they began been working on a master license agreement with the Town. This Agreement would allow them to get their sites without public hearings (David Crompton would approve, ministerially). This first site, which we are appealing, is THE PRECEDENT for all other sites to be approved. The time to act is now! Danville is 18 square miles, so using simple math, they'd want 120 CPMRAs deployed here. The Danville Town Council and Planning Commission worked closely with Verizon, not with the citizens of our cities (scroll to the bottom to watch the recorded meeting), to revise our 20-year old wireless ordinance, which had requirements for safety, health, and limitations on where antennas and towers could be placed. The revised ordinance removed local residential protections and simplified the process for Verizon, AT&T and others to apply for and claim sites for their vast deployments of towers throughout our residential neighborhoods. The Contra Costa Board of Supervisors and planning commissioners did the same in Alamo and unincorporated Walnut Creek. Our elected leaders, and the planning commissioners they appointed, are literally partnering with Verizon, not the taxpayers. In Danville, they agreed that that they would permit these installations in all residential areas without hesitation, as long as the towers were not placed in the downtown district. The beautification of Downtown Danville has been and continues to be their priority, not our residential areas. Residential concerns, according to our elected leaders, are secondary, even though the taxpayers fund all the development in the downtown district. WA17-0005. Stone Valley Rd., opposite 2372 Hagen Oaks Dr., Alamo. WA17-0009. 1951 Green Valley Rd., Alamo. WA17-0011. 61 Pleasant Knoll Ct., Alamo. WA17-0012. 2501 Danville Blvd., Alamo. WA17-0008. Danville Blvd., adjacent to 20 Francesca Way, Alamo. WA18-0002 Danville Blvd., adjacent to 401 Horsetrail Ct., Alamo. WA18-0004 1524 Alamo Way, Alamo. WA17-0013. 184 Creekdale Rd., Walnut Creek. WA18-0003. 1955 Meadow Rd., Walnut Creek. In Alamo, when the Zoning Administrator approved the applications in the first round of decisions, she attached a Condition of Approval that RF emissions had to be measured within 15 days of installation, also on an annual basis, and if any equipment is replaced. Verizon appealed that condition, claiming it was illegal and unenforceable. They refused to measure the emissions! These multiple site applications (which Verizon is claiming is 4G, but can later upgrade to 5G without approval or public hearing or any notification) are the beginning of wireless cell tower "clusters", which are groupings of cell towers. The reasoning behind clustering is because 5G emits high frequency waves which are intensely powerful for a relatively short radius and therefore need to be placed every 2-10 houses (or on every other streetlight, utility pole, or tower). Verizon is trying to get a jump on other telecom providers by grabbing up as many sites as possible in cities where it has been easy to do so (like ours!!!). Once they claim a site, even if it's under the guise of 4G, they can just add their 5G equipment on the same pole without a permit or public hearing. They essentially own that site in terms of adding whatever technologies they want. That's why they are going full-steam ahead and have plans to open up a tidal wave of tumor towers. Have you seen what they're doing in Sacramento with over 300 new antennas? You can expect a lot of people who live there to become ill. It's tragic. WHAT ARE WE DOING WITH THE FUNDS WE RAISE? We are NOT fighting Verizon or the FCC. That would require millions of dollars, lobbyists, big media support, etc., and other well-funded organizations are taking up that fight at the federal level. Our fight is with our Town - requiring them to uphold the ordinance and not abdicate their legal authority to protect us by enforcing aesthetic, least intrusive placement, setback from homes, and other allowed rights. The funds we raise are to raise awareness, retain professional services and consultants, including our brilliant attorney, Anita Taff-Rice of iCommLaw, for her expertise and support in protecting our rights. 1. A revised ordinance that protects residential areas from broad cell tower deployments (and instead allows placement in commercial/business districts, if sites are truly needed and all requirements are met – see below). Danville Town Council members have been working with Verizon and AT&T instead of with us taxpayers to revise the ordinance. That is why we are no longer protected and this is happening now. Verizon mentioned they are bundling up to 25 new site applications to submit to Danville very soon. 2. Rights to property (protect our nest eggs). Properties WILL BE devalued by 20% or more if they are anywhere near a cell tower. At the March 5th meeting, Paul Albritton (Verizon attorney) stated that homes with cell towers next to them will be MORE valuable and attractive to buyers. HUH? 3. Rights to appeal (these should be our constitutional rights). vii. Explicit description of azimuths (If you look at a picture for a cell tower, you'll notice that the antennas are in a triangular formation. The antennas are directional: each points in one direction. Since the tower uses a triangular form, each antenna provides about 120 degrees of coverage. It takes three to provide full 360 degrees). In Monterey, they had evidence that all 13 towers pointed toward Pebble Beach golf course (clearly, they weren’t to address capacity or coverage in the city of Monterey). 5G is 5th Generation technology, the next 'communications advance' after 4G/4G LTE. These technologies operate within different bands in the electromagnetic spectrum, each with unique features as you move up into higher frequencies. 5G isn't just a little step up from 4G. 4G networks use frequencies below 6 GHz, but 5G uses extremely high frequencies (millimeter waves) in the 30 GHz to 300 GHz range. Higher frequencies do not travel far, so 5G antennas are typically placed on utility poles, lamp posts, etc., every 500-1,500 feet (which we know is overkill). In addition, the same carrier cannot use the same pole, so imagine every single pole near your home having this technology on it from a multitude of different carriers. 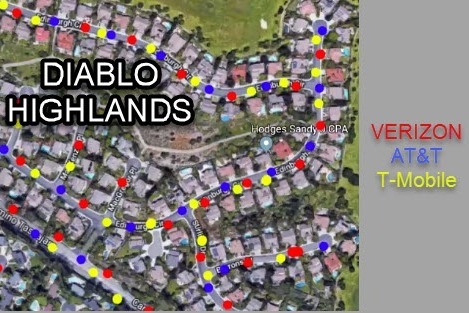 To understand what this will look like, replace "Diablo Highlands" in the picture below with your neighborhood, such as Alamo Springs or Sycamore, and you'll start to understand what the area around you will look like if we don't take action now. Several aspects of 5G and the way our Town of Danville and Contra Costa County representatives are handling these requests should cause you to be concerned. 1) Property values will decrease. Cell towers placed near residential homes result in significant reductions to property values. Not only are they aesthetically displeasing, but few buyers are willing to purchase a home near a tower that is constantly emitting high radio frequency radiation. Decreased demand and fewer potential buyers result in lower sale prices. 94% of people surveyed would not buy or rent a home next to a cell tower. Studies also cite a 20% drop in property values. 2) Your health will be affected. This technology has not been widely deployed, and it is highly debated in terms of health impacts. Verizon is targeting cities where it has been easy for them to get approved applications (like Danville, Alamo and Walnut Creek). Independent research has proven that this technology, which operates in the higher frequencies of the spectrum, has known negative health effects. These include, among many other illnesses, chronic migraines, reproductive issues, and various forms of cancer. In 2017, De-Kun Li, MD, PhD, a reproductive and perinatal epidemiologist at the Kaiser Permanente Division of Research in Oakland, California, conducted a study at Kaiser Permanente, Northern California and determined a 24.2% miscarriage rate due to electromagnetic field exposure. 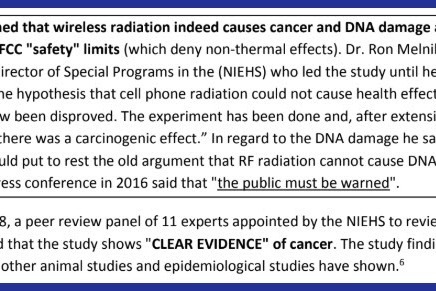 In November 2018, U.S. National Institutes of Health National Toxicology Program (NTP) provided conclusive evidence that exposure to wireless radiation causes cancer. They found "clear evidence" that male rats developed cancerous heart tumors from exposure to cell phone radio frequency radiation according to final reports released today. 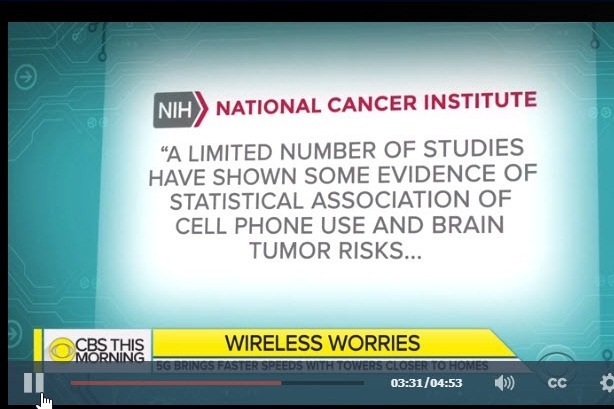 In addition, they concluded the increased tumors in the brain and adrenal gland of exposed male rats were "some evidence" of cancer from the cell phone radiation exposure. According to NIH, the final reports on rats and mice represent "the consensus of NTP" and a panel of external scientific experts who reviewed the study data in March and voted to strengthen the conclusion that cell phone radiation caused health effects. Scientists are now calling for federal action - a quantitative risk assessment and protective policies to reduce wireless exposure. John Bucher, PhD, NTP senior scientist, stated in the NIH press release , "We believe that the link between radio frequency radiation and tumors in male rats is real, and the external experts agreed." "Considering the widespread exposure among our children and the proliferation of cell towers to prepare for 5G, these findings should not be minimized. Effects were found at non-thermal levels, which means that FCC limits are not protective. Until research tells us otherwise, we can no longer assume wireless devices are safe," said Theodora Scarato, Executive Director of EHT. "The rollout of 5G small cells must be halted. Schools need to install wired Internet networks and use cords to connect devices. Landlines should be maintained throughout communities. Practical solutions exist such as ethernet and fiber optic networks. Let's use them. 3) Verizon is deploying their equipment at the top of outdated, poorly maintained PG&E utility poles. In addition, PG&E has been accused of (and appears to be) responsible for recent fires that have decimated parts of California. PG&E was also responsible for the San Bruno fires, which were a result of poorly maintained equipment and improper record keeping. They are possibly facing murder charges for their role in these recent fires. Do you personally feel comfortable putting these heavy transmitters on PG&E poles? Have you seen any of these poles leaning, just with existing equipment? In 2018, Verizon re-submitted one of its applications to install 4G/5G towers 25 feet away from the home of a Danville family with two young children. The Planning Commission and Town Council approved the request with no hesitation. Verizon also submitted several applications to Alamo and Walnut Creek, which the county has just approved. Several of these are also immediately adjacent to people's homes (within 25 feet). Appeals are underway. While Verizon hasn't stated exactly why they "need" all these Danville and Alamo sites, nor have the cities requested this information, East Bay experts did their own research and determined that there are NO GAPS IN COVERAGE near any of these sites (see the proof in the video below). More than likely, Verizon hopes that by widely deploying 5G, it will be able to replace the cable companies and satellite internet and TV companies that some of us are using. It's all about growing their business. However, it is expected to be more than 15 years before 5G replaces 4G for most users. Some of us might not be around in 15 years if this is as massively deployed as they intend. View the video for evidence that there are No Gaps in Verizon Coverage. ARE THERE OTHER OPTIONS TO IMPROVE TECHNOLOGY? Yes! Fiber technology uses light waves instead of electrical signals to transmit data, and distance from the network is not a limiting factor. Because of this, customers on the network have higher speeds available to them, regardless of their distance from a network node. Fiber provides more secure, safer, and faster connections than any generation of wireless. Dozens of companies have launched major initiatives to expand fiber to homes, in light of the uncertainty of 5G. Danville has fiber, but it hasn't expanded it to our homes or even offered it to residents or businesses. It is the safest, fastest way to get exactly what we want without exposing us to unnecessary harm. WHY ISN’T VERIZON OFFERING FIBER TO THE HOME? It would cost them more to install fiber to improve their network. They’d rather keep the profit and pass the real costs to us and our families, in terms of chronic illnesses and eventual fatalities. Isn’t it worth sacrificing a little profit to keep people safe from harm? Verizon's response, "No." WHY DO YOU NEED MY SUPPORT? The Danville Citizens for Responsible Growth (DCRG) is an organization made up of Danville and nearby residents. Our group recently appealed AND WON the Town of Danville's decision to allow Verizon to begin its plans to implement the "Danville Polygon Project", a pole-by-pole clustering plan to develop a blanket of 5G antennas, thus building up Verizon's 5G network surrounding Danville, Blackhawk, and Alamo, CA. Other groups of taxpayers in Alamo and Walnut Creek are working hard to appeal the county's decision to allow the nine locations listed above. We are joining forces , since these sister cities represent a significant amount of people in the East Bay. The questions to ask of our Contra Costa County Supervisors and zoning representatives, and of our Danville Mayor, Town Council and Planning Commissioners, are "why aren't we doing more to stop this in residential areas? Why are the taxpayers shouldering the burden of attorney fees when they are already paying high property taxes?" We need your help in funding this effort to save our taxpayers from negative impacts to property values and possible negative health impacts. WHAT HAVE OTHER NEARBY CITIES DONE TO STOP THIS FROM HAPPENING? 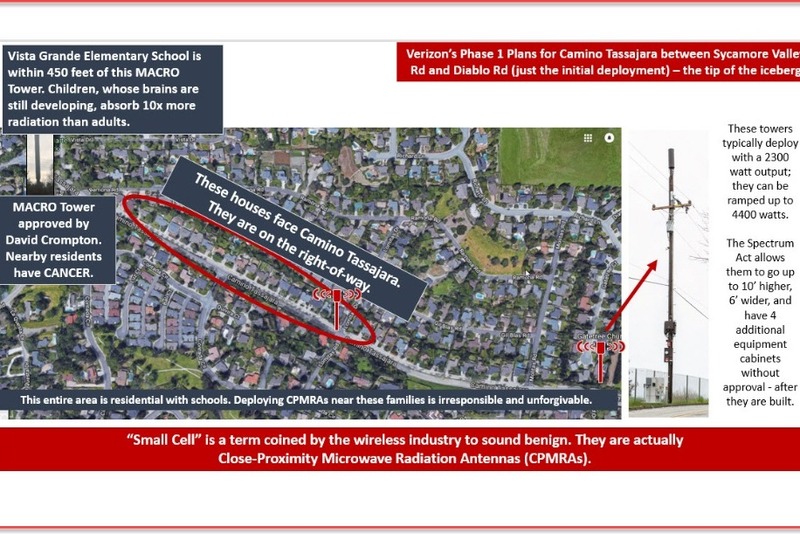 Unlike Danville and Alamo, dozens of other Bay Area cities such as Mill Valley, Petaluma, Oakland, Palo Alto, Monterey and others revised their wireless ordinances to prevent Verizon from initiating its plans to build these high frequency cell clusters near people's homes. Rather than continuing to battle these cities, Verizon found that Alamo and Danville are much easier to work with. Weak leadership, poorly educated town planners, and money have made this possible for Verizon to fulfill its business needs at our personal cost. Contra Costa County and the Danville Town Council did the opposite of Mill Valley, Petaluma, and other local leaders. They revised our ordinances in an unpublicized meeting, and even asked Verizon and AT&T to help draft the new ordinance. Planning Commissioner Paul Radich asked if the town could REDUCE or LIMIT the notification radius for revising the ordinance and for approving future applications by Verizon, to minimize the need for public hearings. Town Planner David Crompton said that he was working with Town Attorney Rob Ewing on a plan to enable Verizon to get these applications approved by administrative review (permit basis) only. Thus, removing the need for public hearings on these applications. In case you are interested....WHAT REALLY HAPPENED WHEN VERIZON FIRST SUBMITTED THEIR APPLICATIONS TO DEPLOY THE "DANVILLE POLYGON"? HOW HAS THE TOWN OF DANVILLE HANDLED VERIZON’S REQUESTS? Verizon made an initial request to install 5G small cell wireless towers on seven sites in Danville. A group of four Danville Planning Commissioners approved a request to amend the Town of Danville Wireless Ordinance so that it could mirror federal and state legislation, thereby making it easier to approve wireless land use permits from Verizon and AT&T. None of Danville’s strong sister towns and cities did this, including Petaluma, Mill Valley, Napa, Oakland, and seven others. Instead, their city leadership did the opposite and tightened their ordinances before Verizon, AT&T, and other carriers could cover their towns with small cell towers. The Danville Assistant Town Planner, Crystal De Castro, stated that “since small cells are the current trend, they are an industry solution to meet the growing demands of wireless users and we need to accommodate this trend.” It appeared that none of the Danville Planning Commissioners seemed to have done their own research or preparation, but instead relied solely on Danville Town Attorney Robert Ewing and Planners David Crompton and Crystal De Castro. 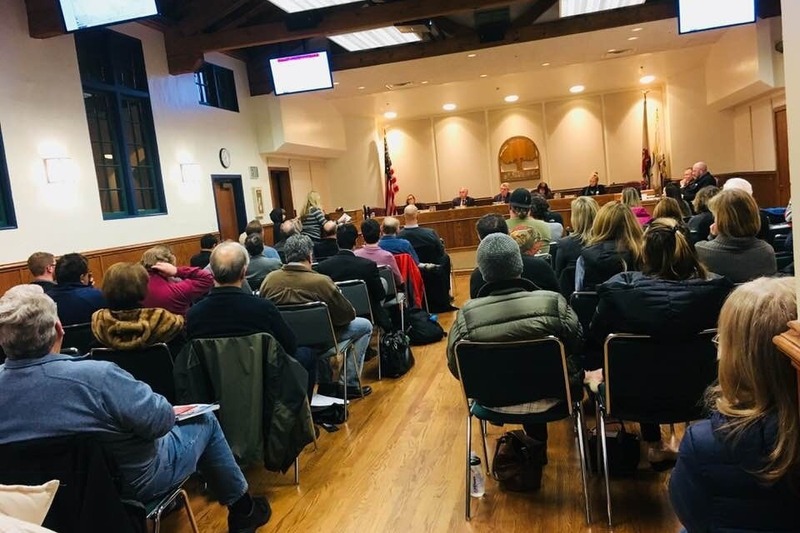 • Robert Ewing, the Town attorney, who does not have specific telecom industry expertise, said these proposed changes to the Town of Danville Wireless Ordinance had been reviewed with and included INPUT FROM VERIZON AND AT&T. He said that his goal was to avoid public hearings in Danville and the need for broad notifications. His preference is to review and approve these kinds of things via administrative (closed door) review. • The original ordinance, established in 1996, required a public hearing review process and broad notification for small cell installations. The revised ordinance does not. • The original ordinance included references to public health and safety not being impacted. Revised ordinance removed any and all language about citizens’ health impacts. • No commissioners asked any questions regarding impacts to public health, expressed concerns about the levels of radiation emitted by these small cell towers, or mentioned any requirements about monitoring the radiation levels pre- and post-implementation. While the specific health effects cannot be argued legally, these are questions that should have been asked of Verizon and AT&T. • Town Planner Crystal De Castro (no longer with the Town of Danville as of October 2018) and Principal Planner David Crompton (who lives in Benicia and is not affected by these towers), along with town attorney Robert Ewing, proposed a streamlined approach that would not require public hearings. Telecommunications companies would simply need a building permit, which the Town Council could approve. • Randy Haberl, commissioner, asked that the towers not be in the downtown district, most importantly. Crompton said we could have standards in our ordinance to protect the beauty of downtown. • Co-location allows small cells to pop up everywhere and anywhere after one location is approved. That means that any pole would be up for grabs by Verizon, AT&T, T-Mobile, etc. • Rob Ewing stated that he had just learned about some of this telecom and wireless “stuff” today – regarding pole construction, indemnification, etc. He is not an expert, nor did he consult with Petaluma, Mill Valley, Glendale, Oakland, or any cities who tightened their ordinances and pushed back on Verizon. • Archie Bowles only concern was to ensure that no installations on downtown streetlights due to visual blight. 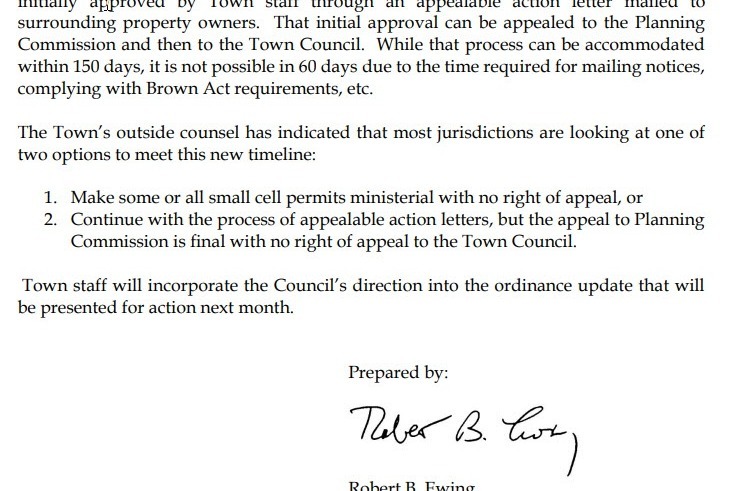 • At 7:09 in the video, attorney Rob Ewing suggested that a motion on an earlier agenda item should be continued due to “lack of a quorum” (only 4 commissioners were present). Danville Planning Commission and Town Council revise the town ordinance that had been in place since 1996. It was not held to public vote. The language was essentially pulled straight out of the Senate Bill and contained input directly from Verizon and AT&T. Removed all references to public health. Who was even notified? Why is a vendor influencing a Planning Commission to revise its town ordinance? The county of Contra Costa also revised its ordinance to support wireless installations, working with Danville leadership. • Planning Commission meeting. Agenda item is Verizon’s request for site approval for a neighborhood small cell tower at 470 Edinburgh Circle, after having been asked by town officials last November to come back with a slightly different proposal that excluded the downtown. • Only 144 homes were notified. And they were only notified 7-10 days prior to this important meeting, which was not sufficient time to do much research, or for the HOA governing that neighborhood to hold a meeting to discuss. • The town planner, David Crompton, had already created the draft approval prior to the meeting. • There was immense opposition from the public, with a simple ask to the commissioners to pause on their decision and review Mill Valley’s strong ordinance that eventually turned Verizon away. 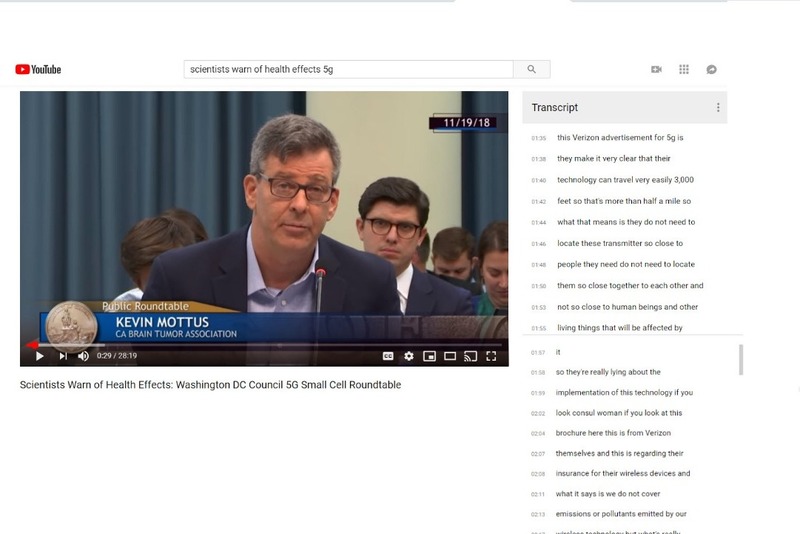 • At 1:26:20 into the video, Randy Haberl suggests that the commission hold off to take time to review the new information that had been provided by the public. • At 1:29:05, G. Mark Graham, an AT&T Telecommunications executive, announces that he just retired from AT&T on 10/19 and is thus no longer employed by AT&T. He did not recuse himself from this vote or any earlier ones. • At 1:31:40, Kerri Heusler makes the motion to approve Verizon’s request. It is unanimously approved. • Approval was thus given to place this tower within 25 feet of the children’s 2nd floor bedroom window at 470 Edinburgh Circle. This is our neighbor. This is a taxpayer. These are our children being affected. The Danville Citizens for Responsible Growth filed an Appeal with the Town of Danville. Our town leadership should have pushed back on Verizon, instead of re-writing the ordinance to be more welcoming before Verizon came back the second time. Even if it brought a Verizon lawsuit, our town will be getting hit with class action suits from homeowners whose home values are directly impacted. In addition, this battle is still being fought at the state and federal level. We do not have to rollover for Verizon and allow them to make us all sick. Danville, Blackhawk and Alamo do not have to be the first in line for high Ghz radio frequencies. We did NOT have to re-write ordinances that in the past had protected us at the local level, to now expose us and take away our rights to a safe environment without the "visual blight". On Tuesday, April 16th, the Town of Danville suffered a significant loss. Our Town Council voted away our rights to safety, property values, and our health. In March, they denied a Verizon cell tower to be placed within 50 feet of a resident's home. In April, they unanimously overturned their own decision and voted for a revised ordinance that allows the same towers to be placed within 50 feet of a resident's home or near a school. They removed the 125 foot setback and replaced it with just 50 feet. They also voted unanimously on a Pole License Agreement that will allow Verizon, AT&T and any wireless provider to deploy their close-proximity microwave radiation antennas on ANY town-owned streetlight, of which there are 16,000! Now, more than ever before, we desperately need your financial support. These decisions MUST be appealed! If you see a streetlight, imagine it covered with CPMRAs and ancillary equipment, even if it's right in front of your house. Do you really expect to maintain your real estate values? Do you think people will consider Danville one of the safest cities in America? Do you expect to not have any health impacts? Our Town Council gave away any local rights we had. There is no reason, and no other city, that would allow deployment of this unsafe technology in residential areas and on school campuses, with just a 50 foot setback. It's the most unreasonable, unprotective ordinance that exists all along the 680 corridor. It's the worst! Even San Ramon is trying to keep these CPMRAs out of residential areas. Our Town Council is keeping them out of the business district because they don't want to ruin the aesthetics of the historic downtown. THIS IS OUTRAGEOUS and you should be VERY ANGRY that if you live in, work in, or visit Danville, CA, you'll now be exposed to a significant level of RF emissions and that someone else gave their consent for YOU to be a human subject/guinea pig for cumulative 4G/5G radiation. Let us know if you can help us with other actions - handing out flyers, providing services/bartering to minimize attorney fees, etc. This is YOUR LIFE and you should be able to protect yourself and your family. Thank you, from the bottom of our hearts, from Danville Citizens for Responsible Growth (DCRG). TONIGHT, April 16, is the Danville, CA Town Council Meeting to determine the fate of our safe, prosperous, healthy little town of 44,000 residents. The media will be there as well as many people from cities other than Danville to support US, the residents of Danville. I would appreciate as many people as possible, especially from Danville, making the time to show up. Even if you can only stay long enough to fill out a yellow opposition card, please make the effort to do that. If people are willing to drive 2.5 hours to Danville from their hometowns, we should be willing to take at least 15 minutes to fill out a card or stay the entire meeting. You may have heard that Verizon is suing Danville because we denied giving them a cell tower site 25 feet from a resident's home. They're claiming it is unconstitutional! Verizon's rights have been usurped in Danville by a Danville resident! We know that they could never win in court as their arguments are not only ridiculous but are not supported by case law, but they are using this lawsuit as a scare tactic against every city. City leaders may be considering caving to Verizon's demands. I suggest to all city leaders - don't be weak, be BRAVE. Your people are counting on you to make strong, brave decisions that put them first. There is enough concern around this topic that those in local government MUST STAND UP for local control. The CA Supreme Court just agreed, unanimously, that local municipalities can control their aesthetics. A wireless carrier cannot tell us how they want our city to look, how our property values are affected, how the 800-pound gorilla (aka health/public safety) that sits silently in the wings will affect us. These are OUR constitutional rights. Don't back down on this one. Tonight, the Town of Danville staff (city attorney Robert Ewing and Planner David Crompton - neither who live in Danville) is recommending that we sign a long-term binding contract with Verizon and AT&T to allow them to deploy their close-proximity microwave radiation antennas (CPMRAs), also referred to as "small cells" on ANY city-owned streetlight in ANY RESIDENTIAL AREA and next to any school property. Danville has nearly 16,000 streetlights. The people in Danville who live near the macro towers are already fighting cancer! After our Town Council just stood up to Verizon last month, claiming they've been "bullied" by Verizon (which is absolutely true), now they're getting sued by them but willing to sign a contract with them anyway? It doesn't make sense. Fighting with our sister cities - locally, across the United States, and across the globe! You will not believe what is on the Danville Town Council agenda for next week. Please attend...and bring your family, neighbors, anyone who cares about this overreach by our elected leaders on our rights to health, property, and safety. Town staff are recommending the following SIGNIFICANT and DISASTROUS resolutions that will forever change Danville. I am personally disappointed at what feels like a bait-and-switch. I thought that we would finally put in place a more protective wireless ordinance which would discourage Danville from becoming Verizon’s (and AT&T’s, Sprints, T-Mobiles...) land grab of expensive Danville real estate at bargain basement prices. I was wrong to believe that four of our five elected officials were brave, and so were all of us who showed up at those meetings and took the time to write and call our Town Council. Both the revised ordinance AND the licensing agreement with Verizon are on the April 16 agenda. I’m not sure how the Town Council will be able to agree to a long-term licensing agreement (binding contract), when the ordinance (the basis for this agreement) is still not approved. We still have a say in this – but it’s critical that you show up and write letters once again. IF YOU ARE ABLE, YOU MUST ATTEND THE MEETING ON TUESDAY, APRIL 16 AT 7:30 PM at 201 FRONT STREET. OTHERWISE THIS WILL NEVER END!!! BRING YOUR CHILDREN. This is their future, and they are even more at risk due to their thinner skulls that absorb 10x more radiation than an adult’s skull. We need your financial support to help us continue to raise awareness in local communities about the dangers of 5G millimeter wave technology. Your contribution will enable us to develop educational materials, organize community awareness meetings, and pay for experts as needed. We hire consultants who are Building Safety Specialists/Certified Safety Professionals, engineers, telecommunications experts, attorneys, and other professionals to ensure the information we provide is the most current and accurate available. Our small team also attends local state of the union town halls with our state and local representatives, speaks at neighboring city council and planning commission meetings, and coordinates activities (including an upcoming rally!) across the East Bay. The 680 Corridor is where Verizon is targeting their latest high-density deployment of Close-Proximity Microwave Radiation Antennas (CPMRAs), which the wireless industry has gently labeled "small cells". They have 87 CPMRAs planned for Orinda (13 square miles), approximately 120 for Danville, and similar numbers for Walnut Creek, Alamo/Tice Valley, Pleasanton, Dublin, and San Ramon. We've been working with Lafayette leadership so they might be the one city that can get ahead of the train rather than trying to stop it as it's already running. We continue to build on our victories locally, but our fight isn't over. The most pressing issue for Danville and neighboring cities is to develop a stronger, more protective wireless ordinance so this doesn't happen again! We meet with other city leaders to discuss the strategies Verizon/Epic Wireless/Crown Castle are using so we can be ahead of the curve when they come at us with threats and bullying tactics that make local elected leaders and city staff fearful of being sued. Our team has been gathering successful local wireless ordinances and is working to ensure that similar language is incorporated into our local ordinance. We are also working with Governor Newsom, Congressman DeSaulnier, Assemblymember Bauer-Kahan, Representative Anna Eschoo, as well as organizations and experts that include Dr. Joel Moskowitz, Ellie Marks (founder of the CA Brain Tumor Assn), Paul McGavin (Scientists4WiredTechnology.com), Eric Windheim, and many, many others whose names you've likely heard. We are working to change things, raise awareness, and lobby to change the law which favors wireless providers over people.